When ease of setup and price enter the equation, the PlayStation VR is the best all-round VR package currently available. It's not the most powerful and it does have a few small issues, however its low cost, good selection of games and ease of use make it a really great way to get into VR. For those of you who want the quick take away then this is it - PlayStation VR is the best all-round VR package currently available. It's not the most powerful and it does have a few small issues, however its low cost, good selection of games and ease of use make it a really great way to get into VR. 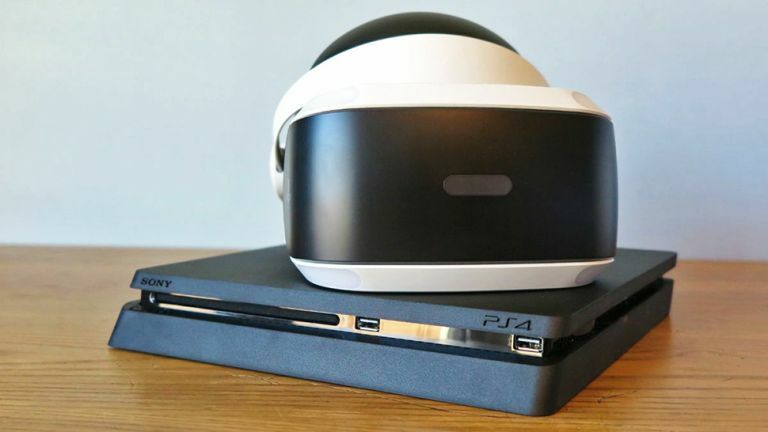 As such, we can easily recommend PS VR for the vast majority of gamers and tech enthusiasts. For those waiting for fidelity on par with with famous Red Dwarf immersive simulation Better Than Life, however, then we advise that you should wait a little longer (a lot longer if you demand Yvonne McGruder levels of immersion!). Before we get down to box contents, let's quickly get the market options clarified. The PlayStation VR comes in two varieties for you to purchase, the first being the simple stand-alone PS VR system that comes with the headset, processor unit, headphones and all necessary cabling needed to hook the system up for £349. The second option is the PlayStation VR Launch Bundle, which includes everything in the stand-alone package as well as a PlayStation Camera, two PlayStation Move Motion Controllers and a copy of PlayStation VR Worlds. This retails for £390. Both versions however come with a PlayStation VR demo disc with a selection of VR games for you to play. So what do you get in the box? Open the PlayStation VR box, which is white and emblazoned with the PlayStation logo, and you are greeted with a small blue box. Sitting on top of this is a large blue manual, while inside sit a series of smaller blue boxes. Each box contains a component or cable for the system, with one box holding the seperate processing unit, while others holding the power and HDMI cabling. Underneath these smaller blue boxes lies the PS VR headset itself, which is wrapped in a soft synthetic bag. The PlayStation VR headset, despite being made of a lot of plastic, feels quite heavy in the hand and - if we are being honest - rather cumbersome at first. Putting it on the head for a trial fit however and it no longer seems so weighty, with a soft rubberized layer coating the forehead rest and the bulk of the weight supported here rather than the nose bridge. Putting the headset on requires manipulation of a series of buttons, which allow various parts of the headset to be extended or contacted as desired. As we will find out later, this is crucial for generating the immersive VR experience you are investing in. Around the business end of the headset, which if you are asking is a a 920 x RGB x 1080 OLED display, also sits a large wrap-around, black rubber shield. This not only aids comfort while wearing the device, but also helps block out that undesirable reality you are trying to escape from. The headset aesthetically is very minamalist, with instersecting strips of black and white punctured - when the system is fired up and running - with neon blue lights. It's as if someone smashed an iPhone and Tron together - understated, clean and futuristic. Moving away from the headset, the other major piece of hardware in the box is the PS VR processing unit. This is a small black box that sits between the PlayStation 4 and the PlayStation VR headset, with a series of ports located on its front and back. The processing unit also needs its own power source, so if you currently have your PS4 hooked up to a single mains socket, then you're going to need a multiplug or power strip. Lastly, of course, is the system's necessary cables - and boy are there a lot of them. As you can see from the picture below, there are so many that Sony has gone and made the smart move of numbering them, both on the cable and in the included setup manual. This is a really welcome little thing as connecting these all up to get the system running is made far more straight forward with simple numbered steps. Of course, it doesn't solve the issue of the cables still existing once the system is in use, so if you are going to pick up a PS VR then it may be worth thinking about how you could hide many of them. Before you set up the headset however, first you need to install a PlayStation Camera (that is if you haven't already got one of course). This is a mandatory part of the PS VR system, with the headset simply not working without it, so it does raise the point of why one isn't included in the stock kit. The camera can be placed on top of your TV of choice, or beneath and in front of it, with a multi-hinged clamp allowing you to easily lock it in place. Once the camera is plugged in (into the back of the main PS4 console), you then need to follow the step-by-step guide in the manual to hook up the processing unit, extra power supply, headset and earphones. Another, shape-based guide system ensures that you don't plug the wrong cable in the wrong way round (see the picture below). Once everything is hooked up you are then asked to power up your TV, PS4 and PS VR headset, the latter being turned on via an in-line switch. Unfortunately, this is not where the immersive VR experience begins however, as as soon as the PS VR headset is active the system mandates a software update. Unlike some game updates however, where massive downloads are required, this update is quite small and completes relatively quickly. Once completed, you are then warned about you should and should not use the PS VR headset, as well as run through basic safety - afterall, you are soon going to be shutting out the world around you and, well, you don't want to accidently fall through your brand new 4K TV do you? And then you see why the PlayStation Camera is so crucial to the working of PS VR - the camera is used to track the orientation and movements of your head. As part of the headset's calibration process you have to line up your camera so that you can fit your head in a small square box on screen. This is something you should get used to as well, as between uses you are often asked to run through this head-in-box action to ensure the system knows where you are. PS VR doesn't just deliver 3D visuals either, but 3D audio too. This can be enjoyed by plugging the bundled earphones into the VR headset's inline control pad - where the power button, as well as volume up and down buttons are located. Audio can be enjoyed as normal out of your existing setup, however from our experience for full immersion the 3D sound is a must. When you first start receiving the VR version of your PlayStation menu through the headset you also will most likely have to make a few adjustments to the headset and how it sits on your head. This is done with the aforementioned buttons, as well as rotary wheel on the headband, which makes fine tweaks to the tightness. The screens themselves can also be pushed further away from your eyes, or brought closer in to help ensure good focus too, with a button on the bottom of the headset actuating a slide mechanism. All these adjustments are extra important if you wear glasses too, as while the system has been designed for wearers, there is no doubt about it that it is far harder to ensure a snug, in-focus fit, with glasses on. Also, it is far harder to eradicate light bleed, the effect of daylight from outside the VR headset creeping in round the rubber surround. We could always eventually remove it, however it often required lots of manipulation of the headset while on the head, which while not uncomfortable did get a little annoying. UPDATE:We have now played through the entirety of Batman: Arkham VR. Check out our detailed coverage now! To undertake our initial, first 24-hour test of the PS VR, we booted up the system's included PlayStation VR Demo Disc. This disc has roughly 12 VR titles for you to play to get a taste for their full-game equivalents. Naturally, these games can be purchased in the PlayStation Store. These games include racing titles such as DriveClub VR, space shooters such as Eve: Valkyrie, combat simulators such as Battle Zone and a variety of other VR experiences. From what we've played so far, all of these titles were interesting and really showed off what the PS VR could do - and we will update this review accordingly with our definitive verdicts soon - however if we were to choose one from the bunch that could best help communicate PS VR's potential then it is VR Worlds. VR Worlds includes a series of immersive experiences designed to draw you into the world of virtual reality. Ocean Descent, for example, isn't a game so to speak, but instead a five minute or so on-the-rails experience where you play a diver in a diving cage being slowly lowered through the various different stages of the ocean. Within the cage you can look round a full 360 degrees to gaze upon the ocean, as well as its flora and its fauna. Look up in the cage and you can see the cable holding your cage extending back to the water's surface, with the shadow of the boat you just dived off also visible. Equally, if you look down through the cage's barred floor, you can gaze down into the murky depths in which you are descending into. We've got to say that this gentle and simple experience really blew us away when we played it. Watching fish, manta rays and jelly fish swim past the cage - sometimes so close that you think you can touch them - was really enchanting and it really made you think what could be possible in VR. Indeed, while the fidelity of the graphics on offer was nowhere near the fidelity of today's most cutting edge AAA non-VR titles, the immersive element that PS VR delivers definitely made up it in our eyes. Being surrounded by a virtual reality, one where you can even move within reason to inspect things close-up or back away as desired, all the while being able to look about you and not see the edges of the computer program was delightful. Are the worlds offered in these titles graphical showpieces? No, they certainly are not, and playing Fifa 17 in VR was nowhere near the experience it is on an upscaling 4K TV, however many of these titles, such as the Tron-tastic Battle Zone - a game where you pilot a tank around a minamalist, cell-shaded combat arena blowing up rivals - don't need insane textures or post-processing effects to make an impression or be fun. And that's the point right? The thing that most people should be evaluating when buying a VR headset today - what software library does it have? Well, in the case of PlayStation VR, it has a lot already with even more incoming over the next month or so. With IPs such as DriveClub VR, Eve: Valkyrie, Rez Infinite, Resident Evil and more accessible, it is hard to see the games drying up anytime soon. So, while we haven't had time to extensively test the software on the PlayStation VR, something that we will do in-depth over the next couple of weeks and months, we are impressed overall with the hardware and are enthused for what the platform can do going forward. There are a few issues, with the lack of key components of the system not included with the standard system foremost amongst them, however away from an extra financial burden and extra level of adjustment for glasses wearers to eradicate light-bleed, these are few and far between. No, the PlayStation VR is a well-designed and - crucially - fun product that will allow more people than ever before to make that leap into virtual reality.